A few weeks before the Sandy exhibition came to a close we had the first snowfall of 2013. I was working as a curatorial assistant on the show at that time, and at Phong’s request I set out to photograph the sculpture garden amidst the freshly fallen snow. The tumult of New York seemed far away that morning and the muffled bangs and growls of trucks on the BQE filtered down slowly into the canyon between the buildings as if borne upon the falling snow. 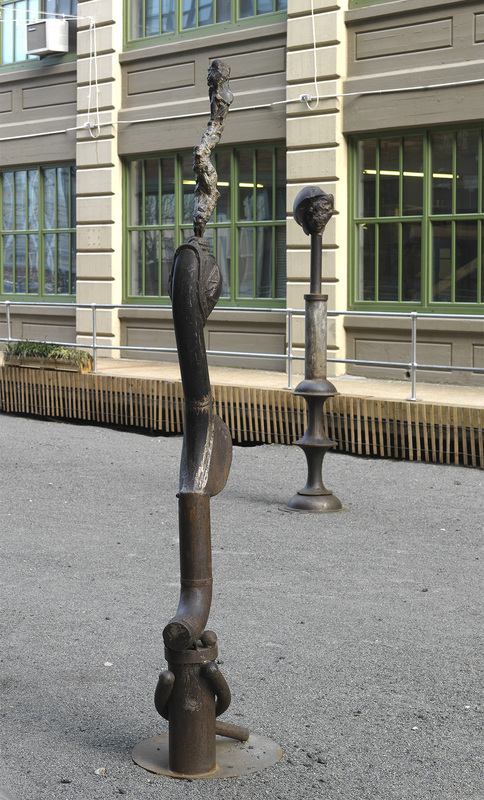 Stepping out into the courtyard, I allowed my feet to guide me as I meandered freely in between the three steel sculptures by Lee Tribe. Lee Tribe, L to R: “Orator II, Dignity,” 2013. Formed, welded steel, dimensions variable. “Orator I, Wisdom,” 2013. Formed, welded steel, dimensions variable. Courtesy of the artist. Photo by Brian Buckley. Tall and skinny, the sculptures seemed to writhe like snakes as they stretched up towards the sky, their dark patina popping in sharp contrast against both the frosted ground below and the leaden clouds above. Ostensibly abstract in nature, they bore the titles Orator I, Wisdom: Orator II, Dignity: and Orator III, Aspiration—titles which suggested that these metal monoliths were in fact speakers, each with something different to say. Listening to the snow crunching underneath my shoes, I crossed the courtyard and climbed up a fire escape to get a new perspective. Viewed from above, the sculptures assumed newly anthropomorphic dimensions, resembling distant commuters down on the street, seen from the window of a skyscraper. However, unlike the scurrying millions in their constant state of motion, the Orators remained motionless, their contorted forms frozen in time like the hapless victims of Pompeii. I raised the camera to my eye and took a photograph. Meanwhile, indoors on the top floor of the exhibition, four short steel sculptures by Lee Tribe sat on a wooden table, bathed in the warmth of a nearby radiator that hissed and gurgled as the hot water worked its way through the pipes. Alighting on the sixth floor after climbing the stairs, they greeted me silently as I entered the gallery, waiting impassively as I caught my breath. Smaller in scale and denser in composition than the outdoor sculptures, these pieces resembled heavily-abstracted human heads. Each one featured an oblong egg devoid of recognizable facial features, characterized instead by alternating smooth surfaces and pockmarked eruptions of welded metal. These ovular forms were welded onto mechanical-looking bases, creating the impression of macabre trophies, as suggested in their titles: Trophy (Head) I; II; III; and IV. Unlike classical busts, which convey honor upon the head which they support, these trophies deferred honor elsewhere, onto the hunter or the maker, or the collector perhaps. “Just whose heads were these?” I wondered out loud, mumbling to myself under my breath. The heads remained silent of course. They were too busy staring out the window, watching the snowflakes drift slowly into the courtyard below.